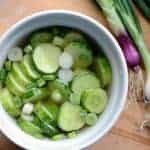 Quick and easy pickled cucumbers with onion made in the refrigerator; our favorite way to use summer cucumbers! Having a huge garden is awesome when the tilling, planting, weeding, watering, weeding, and more weeding start to mean gobs of fresh vegetables for me to use. It seems like such a labor of love for months and then all of the sudden you are rewarded for your hard work. That reward is beginning for me and I couldn’t be more excited. I’m currently harvesting green beans by the gallon, basil, zucchini, yellow summer squash, and cucumbers. I’m just chomping at the bit for tomatoes, peppers, and sweet corn to ripen. Here’s what we had for dinner last night: sautéed yellow squash, green beans, corn on the cob, cantaloupe, quick pickled cucumbers, homemade whole wheat clover rolls, and smoked sausage. It was heaven I tell you. Heaven! Summer on a plate indeed. I was looking at the meal and thinking that my grandma would have been proud; it looked like a meal she would have served this time of year to her big family of boys from her gigantic garden. Thinking about my grandma makes me happy. She is a wonderful woman who raised 13 kids (11 of whom were boys!) and I grew up just down the road from her farm in Southern Indiana. 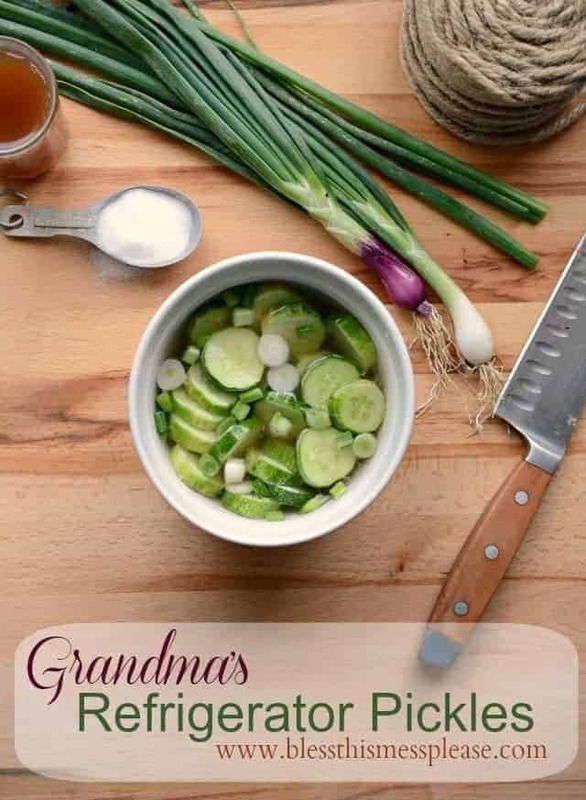 This recipe for quick pickled cucumbers, or refrigerator pickles as we call them, is from her. It’s super easy and tastes just like summer should. Have you ever had this kind of thing? You basically make a quick brine and add what you want to it. My mom always just did cucumber but grandma would add just about anything from the garden – onions, bell peppers, whole cherry tomatoes. Add what you think you’d like pickled. Easy and delicious. Sometimes I think there’s no need to dress up garden veggies with more than a bit of vinegar and water. Enjoy! White vinegar is the traditional vinegar for this recipe and a great place to start. If you know that you like apple cider or rice wine vinegar they are also good. These are delicious on our favorite pulled pork sandwiches (made easy in the slow cooker! ), as a side for everything summer, and to eat for a snack. You can’t go wrong with this simple dish all summer long. Want to add a little spicy? Toss in a jalapeno cut in half (delicious!). I love these glass containers with lids to have things like this in my fridge. I also use a mason jar and one of these reusable lids really often. In a small bowl add the water, vinegar, sugar, and salt. Stir to combine and until the sugar and salt have dissolved. Add the cucumber and onion. Taste and adjust the ingredients to your liking. All the cucumbers should be covered in the brine, if you have lots of cucumber or are making a big batch, make more brine. Let the mixture rest in the fridge until you are ready to eat. The flavors develop over time, so an overnight soak is great but mine are normally gone by dinner. I love adding the sugar and my mom does too, but my grandma doesn’t add that much (she only adds a few teaspoons). I say try it and see what you like. You really can’t mess this up. Just adjust to taste and enjoy! The pickles will last at least a week in the fridge but get less crisp as time goes on. 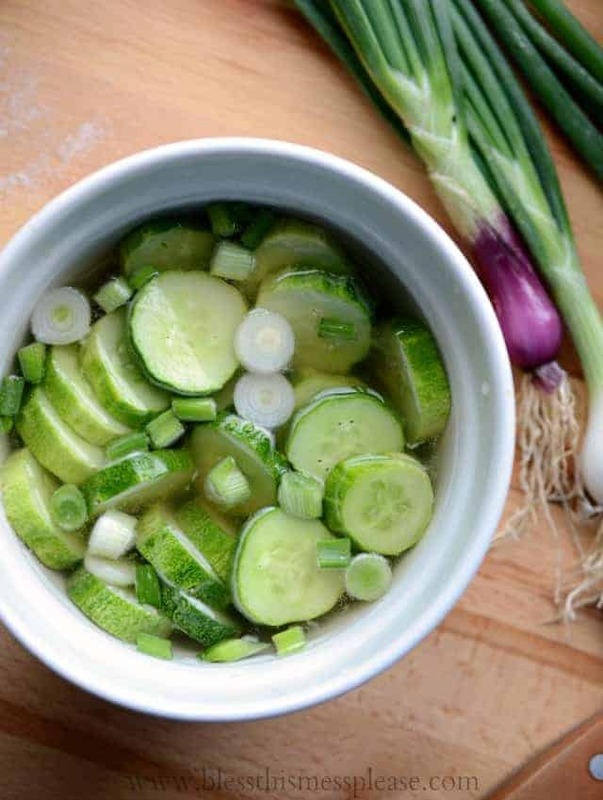 You can reuse your brine a time or two, just add more cucumbers! Aren’t my baby onions cute?! They were the first I pulled and they are tiny… I think I’ll wait another month or two before I pick any more so they aren’t quiet so itty-bitty. Enjoy the bounty of the summer and thanks for reading. 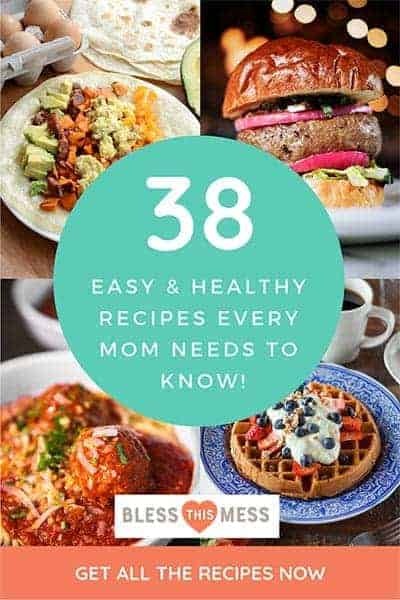 This recipe was first published in August 2013 and was rewritten and updated in July 2017. It’s still a favorite in this house! I don’t have a garden this year for the first time in a long long time, I miss picking fresh cucumbers the most and doing a quick pickle in the fridge! Oh yum! I am totally for this adventure! This is one of our family favorites and easy to to with an abundance of garden cukes you don’t want to go to waste. We add a little kick to ours….great to serve up at parties! I made pickles! They are almost gone and its not even dinnertime yet….uh oh!! I like the sugar in there, reminds me of my mom’s bread and butter pickles. I couldn’t stay out of those either! Happy Pickle Day! I like it too! Must be because it reminds me of my mom and grandma too! These rock with your sloppy joes and oven fries!!!! My tummy is so happy right now! I am trying out your recipe tonight. I’m putting in a bay leaf with it. These pictures looks so great. 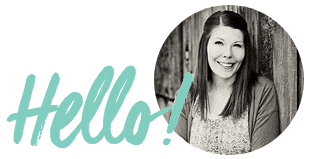 I love the way you laid everything out – it really makes me want to try making these at home. I love quick pickling onions and cucumbers, I think I might do both in one jar! Thank you again for sharing, can’t wait to try these when I have some free time! Enjoy! These are forever one of my favorites! I made four huge jars of pickles from our home grown cucumbers following this recipe… they are so awesome and they are not going to last long before getting eaten! What a terrific snack in the hot weather. We have lots of cucumbers still to be harvested… I’ll be making these pickles for weeks! Thanks for the great recipe!! I’m so glad you liked them! My cucumbers are flowering but no cucumbers yet, I’m so excited to get some! Sometimes I feel like we had different grandmas. You always talk about recipes you got from her or memories you have at her farm, and they’re completely foreign to me! I guess that’s what I get for being a city girl. Thank you for sharing! I just made a batch with cucumbers, onions & carrots. I can’t wait to try them! I like the sliced carrot in there! Let me know how it tastes and ENJOY! Super simple to make and yummy! Was great for quick. I did use pickling salt instead and added garlic. Yum. How long can these last in the fridge? I think they are best eaten within 24 hours, the cucumber starts to loose it’s crunch and I don’t love that. It’s just pickles in vinegar water though so if texture isn’t an issue for you they’d last a week or two for sure. These are delicious- only lasted a day! Have you ever reused the brine for another batch? Yes! I’ll often add to my brine for a few days before tossing it! That second batch is sooooo easy! They will last a long while because the vinegar is a great preservative but the textures starts to get soft and not very appealing. I think that 2-3 days tops is about as long as I think they are really good to eat though they aren’t “bad” after that. I made these today for a barbecue. Everyone liked them! Thank you! How long would the cucumbers last in the fridge (and prepared this way)? They are best eaten day of because the texture of the cucumber starts to get soft. If that doesn’t bother you they last a long while in the fridge because vinegar is a great preservative, they just aren’t crisp. Made this recipe once and love it! How long do the Pickled veggies last or how can you preserve them the longest? Made them they came out great thanks for the recipe. How long do they last in refrigerator? They last a long time though they start to loose their crunch as time goes on. 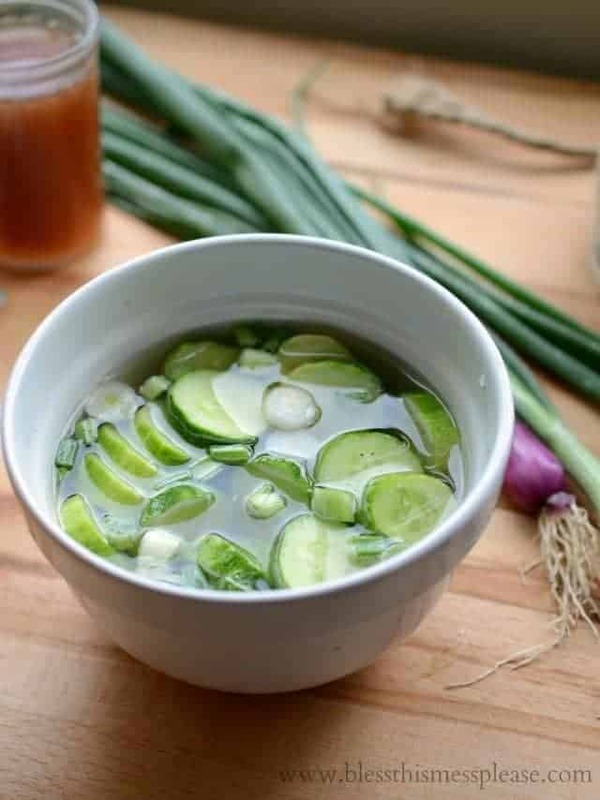 I like to eat them within a day or two and then just add new cucumbers to my brine. Your pictures look stunning! Definitely cannot wait to give this recipe a try the next time I pickle some cucumbers. Would this same recipe work with something like red onions? Thanks! I must say this is a very simple, quick, pickle, recipe. As a matter of fact, I will try this recipe tonight. Because I am surely a pickle eater…..dill, sour, hot,ect. Will store bought cucumbers work? Yummy. My husband couldn’t wait to get into them. I used a mixture of apple cider vinegar and white vinegar and used half. splenda and half sugar. Just to taste, I’d start with a tablespoon. Yes! My grandma always added whatever veggies she had in her garden. Great recipe! I added colorful bell peppers and used red onions. It was beautiful and everyone at our Christmas dinner enjoyed it. Thanks so much! Yum! How long would these last in the fridge (I have heaps of cucumbers!). And in the pantry? They get softer as time goes on, so I like to make smaller batched more often, but they will last a really long time if you don’t mind them loosing some of their crunch, up to a week for sure. I know this is not natural or organic but I use a little Splenda instead of sugar. Yes, it would work just fine, I know my grandma does. I used less sugar, as I’m not a huge fan of sweet pickles, and they were amazing! My kids loved them. I’m about to throw in some more cukes to the existing brine for the next batch. ? Thank you Sharon! I always like to share recipes that have meaning to me 🙂 ENJOY! Great! I was so happy to find this— tastes just the way my mom made them. I’m so glad you found it. Some of those old time recipe are just the best aren’t they! I love the vinegar/water ratio. They are not overly acidic. Made my first batch with Persian cukes, which are quite sturdy, and they are not losing their crunch so far. This simple recipe is a keeper. Thanks Melissa! So glad you are enjoying it David, great tip on the Persian cucumbers too. We can’t keep enough of these pickled cucumbers in the fridge! I’m replensishing it every other day. They are just that good….and addictive!!! I followed your recipe to a T including the sugar. This recipe is the BEST!!! Thank you for sharing! Me too! Just reuse my brine and make it again and again! Add one piece of smashed garlic if you really want to get crazy. SO EASY! I love that! Thank you for letting me know. We are in the same boat and make them over and over again all summer long. ENJOY! Got some cukes from a coworker and was slicing them up when I remembered that I didn’t have mom’s recipe. She’s in memory care, so I can’t ask. This is a taste from my childhood! Thanks so much. Thank you so much for leaving that comment. I read it out-loud to my husband because it was so sincere, really made my night. This recipe is great, and so easy! I used a large cucumber that didn’t have much flavor. I doubled the recipe and used about 2 tbs. of sugar, since the cule didn’t have much natural sweetness. After a few days, what a difference! They were crisp and flavorful! This recipe is very versatile, too. I used a blend of vinegars, the cucumber, onion and chives, but you can vary that, of course. The most important thing to remember is the ratio of vinegar to water, and to keep the vegetables covered by the solution. I recommend this recipe! Yes to all of this! This is why I love it too, you can make it your own, use what you have, and enjoy it over and over again. Thank you for the great review Laura! my son and I are trying out your recipe for the first time, we just picked our cucumbers from the garden and are excited to see how it turns out! They look delicious! I added garlic to it. I’d love to hear how you liked them! That garlic is a great idea! I like to add it when I have some too. Thank you so much for a quick, simple recipe! It’s exactly what I was looking for…to pickle my garden cucumbers in the fridge. Thanks again. How many times can you reuse the brine before the brine goes bad or is unsafe? I feel like it depends on how fast you eat your pickles! I normally keep my brine around 2 weeks. Sometimes that’s refilling it daily or sometimes that’s only a batch or two, depends on our eating habits for sure! It’s in the fridge right now. Hope it turns out well. I added some turmeric in my vinegar brine! How did they turn out? !